Precision manufactures and reconditions OEM replacement parts for most escalator models and products. Please follow the link(s) below for some samples of Precision replacement parts. If you do not see the solution you are looking for, please call 800-233-0838 or 908-259-9009. You can talk directly to one of our expert engineers to discuss your repair applications and goals. 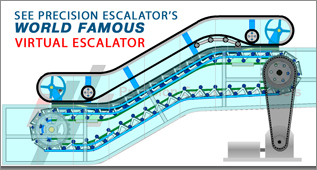 Our Inventory of parts solutions for most escalator models is incredibly extensive. Not all parts are in the below sample catalog below. Please call to discuss our many solutions.